Unlike the many high profile film festivals that take place across the UK each year, slick black tie events are not a feature of Motovun Film Festival. WHILE modest in its approach to appreciating cinema, Motovun Film Festival in Croatia cannot be said to lack class. At last year’s pre-screening reception held for the latest offering by Austrian filmmaker, Ulrich Seidl, I found myself chatting with Festival Director Igor Mirković about the past and future of one particular celebration of cinema that is in no hurry to outgrow its humble roots. “We didn’t have the idea to make a festival that would be big or important for business people,” Igor explains in a thick Slavic accent. Every so often he scans the crowd, playing host by acknowledging a guest with a swift no-nonsense wave of his hand. “We just wanted to make a festival which would be a nice place for watching films” he says, adding, “We believe that Motovun with its open air cinemas is a perfect place”. The town of Motovun is located in the heart of Mirna River Valley in Croatia’s northern province of Istria. 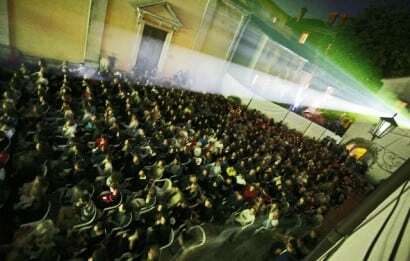 Its historic centre is perched on top of a 277 metre hill and it is here that musty, stone-walled cellars of Roman, Gothic and Venetian buildings are converted into air-conditioned screening rooms while the inner public square undergoes the daily transformation to become a cinema under the stars. In the last week of July each year, Motovun’s ordinarily dormant farming community of 300 inhabitants becomes a hive of activity when up to 50,000 visitors occupy its maze of medieval streets. The town’s one grand hotel is reserved for notable guests and event organisers and so the majority of those attending the Festival seek accommodation in the eco-camping facilities located at the base of the town’s hill. Sites are available here for as little as seventy pence per night. Each morning the bronzed and bare bodies of the Festival’s mostly young attendees emerge from sticky tents to make the daily pilgrimage in the mid-summer heat towards Motovun’s centre where they will enjoy a full day of film, food and festivities. Due to the combination of affordability and its unconventional – Glastonbury meets Sundance – approach to appreciating cinema, Motovun Film Festival began as a haven for local students and backpackers seeking an off-the-beaten-track experience. Retaining this bohemian appeal is an important part of MFF today, particularly since it has become one of the most widely recognised film festivals not only in Croatia, but in the whole of former Yugoslavia. In this part of the world, events held in cities such Pula or Belgrade steal the international spotlight with a focus on the glitz and glamour of world cinema. Meanwhile, MFF revels in a more subtle form of praise, attracting the attention of an alternative audience through loyalty to art over industry. “At the time when we started fourteen years ago, the films which were not made in Hollywood were not distributed in this country”, says Igor. His expression remains stern as he checks his watch. In a moment he will be introducing the first feature of the night and already the crowd can be heard shuffling into the outdoor cinema. In its fifteen year history, MFF has showcased a number of International gems that have gone on to find popularity in the broader marketplace. UK cinema in particular has enjoyed a large degree of success, walking away with the Festival’s main prize, the Propeller of Motovun (inspired by Czech-Austrian inventor, Joesf Ressel who invented the propeller in Motovun) more times than any other country for films including Billy Elliot in 2000,Bloody Sunday in 2002 and Ae Fond Kiss in 2004 among others. Last year quintessential British filmmaker Terence Davies was in attendance at Motovun as the Festival’s Guest of Honour. An honour that falls this year to Austrian Director Ulrich Seidl who will be welcomed along with his recent Paradise Trilogy (Paradise: Love, Paradise: Faith, Paradise: Hope), which will be screened as part of the Festival’s main programme. Seidl’s presence at the Festival will see him join the likes of Ken Russell, Paul Thomas Anderson, Stephen Daldry and Vanessa Redgrave, all of whom have visited Motovun in previous years. While there may be no shortage of well-known guests gracing Motovun, Igor confirms that the festival’s popularity has seen a slight decline. “You cannot be at the same level all the time,” he says with a shrug. “I believe that we are still popular enough to be happy with the number of the audience and the response we have with media in this country”. While it is this very nonchalance that seems to attracts filmgoers to Motovun each year, one can’t help but wonder if Croatia’s recent inclusion in the EU will prompt a change in attitude. For now however, such worries seem far from the mind of organisers and audiences alike. Igor checks his watch one last time. As he prepares himself to leave he pauses to offer one final word of reassurance. “We believe that our concept is good. It is accepted among the audience,” he says. “So long as they are willing to come to Motovun and watch films with us we don’t think we have to change”. As though on cue, a cheer erupts from the filled-to-capacity audience, it rings through the streets of Motovun and is enough to suggest that Igor might be right. This year’s festival runs from 23 July – 28 July. See motovunfilmfestival.com for more information.